Buy a ROLI Seaboard Block before 22nd October and claim two synths for free! "One super powered keyboard. Two superb soft synths. Hundreds of expressive sounds." Buy a ROLI Seaboard Block before October 22nd and you'll be eligible to claim two incredible desktop synthesizers, Equator and Strobe2 - absolutely free! With hundreds of presets included, all optimized for the tactile surface of the Seaboard, you'll be able to Supersize Your Sound straight out of the box. 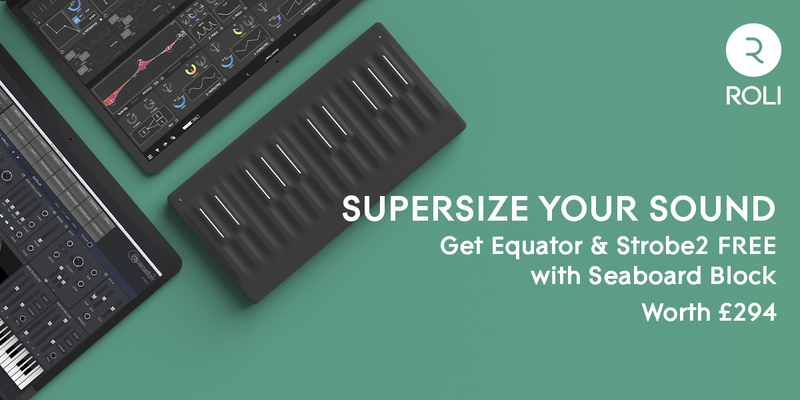 ROLI's Equator is a high-powered software synth which helps bring out the best features of the Seaboard. A full version of Equator is bundled with the ROLI Block as part of the Supersize Your Sound promotion. Equator lets you shape your sound in multiple dimensions with MPE (MIDI Polyphonic Expression) technology. This ensures you'll get the most expressive performance possible, making the most of the Seaboard Block's unique surface. FXpansion's Strobe2 is a software synthesizer with hundreds of electronic sounds. Featuring everything from vintage synths to experimental pads, Strobe2 is the ideal platform to expand your palette. Strobe2 also includes advanced tools to create your own sounds, and is completely MPE compatible, providing the biggest expressive potential when paired with the Seaboard. 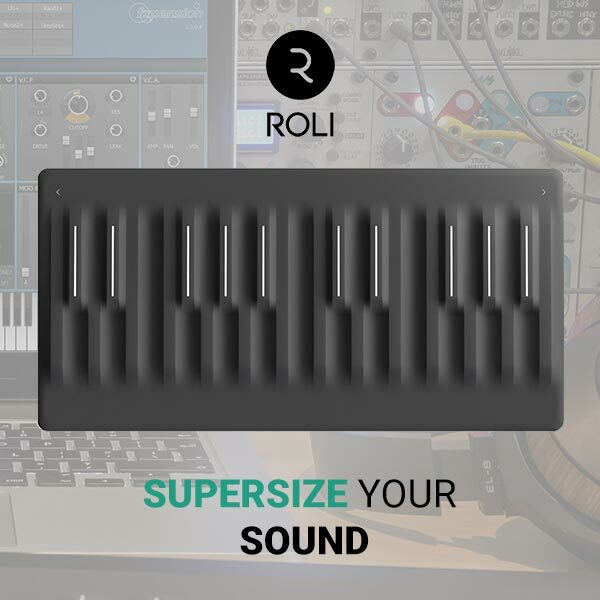 Purchase a ROLI Seaboard Block or Seaboard Block Bundle from Gear4music before 22nd October 2018. Register your new purchase at myROLI. Download your full Equator licence from your account. Access Strobe2 by redeeming your serial number in MyROLI. Login and create an FXpansion account here. Once logged in, click “Register a product” on the account overview page. Enter your serial number. After registering, you can download Strobe2 from the “Product Downloads” page. Click on "View all available downloads" and download the latest version for your platform. Only valid on Seaboard Block and Seaboard Block Bundle purchases made on roli.com or through authorized retailers between 8th — 22nd October or registered on MyROLI between 8th — 31st October. Offer not valid on refurbished, pre-owned, demo, or B-stock units. Advertised worth of promotion equal to the value of each standalone software, upgrade value total is $158. Only 1 free license of Equator and Strobe2 per customer. Free licenses are redeemable after registering eligible products at my.roli.com. Offer not valid on prior orders.